I use a bunch of different scripts in Illustrator, but sometimes it’s a little cumbersome to trigger one. Thankfully there is a pretty cool free extension called Script Bay that makes using scripts a lot easier! I tweeted about this extension from a post by John Wundes, but it’s worth mentioning to those who don’t follow Vectips on Twitter. 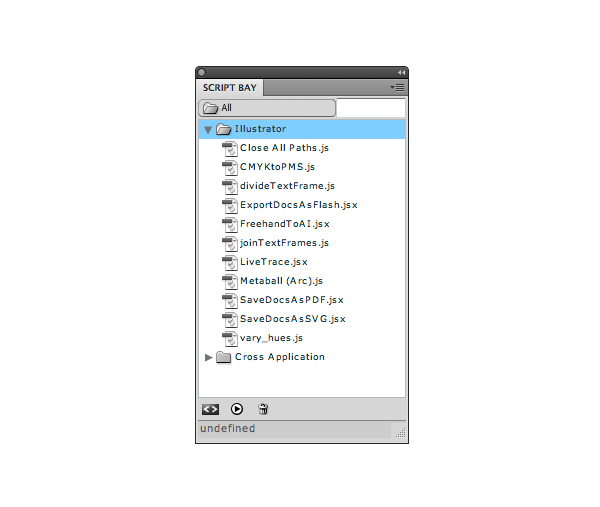 Script Bay is a free Creative Suite CS5 script panel replacement created by In-Tools Solutions. It’s pretty easy to get setup and the creators are constantly updating and improving the extension. For me, it’s a lot easier to access the scripts from a panel rather than fiddling with menus. Check out the In-Tools Solutions site to download the extension and learn how to install it. I had a couple problems installing the extension because of a bug in the Adobe Extension Manager CS5 and Mac OS 10.7.1. Adobe has a patch that fixes the problem and the next update to the Extension Manager should fix the problem. Read this forum thread for more info. Like scripts? Check out my post 10 Free and Extremely Useful Illustrator Scripts. It’s an old post, but still has some good scripts. Appreciation to my father who shared with me about this webpage, this weblog is really awesome. right. This publish actually made my day. You cann’t consider just how a lot time I had spent for this info! your content is not good., however suppose you added something that makes people desire more? I mean Script Bay: Script Panel Extension | Vectips is kinda vanilla.